One of my most nostalgic moments was when I actually took a momentary break from Tokusatsu. It's something to think about that back in my College days, I still think about the moments I wanted to take a short break from Tokusatsu as a whole. There was a time I wanted to see more Tokusatsu even as an adult. Later, I thought that sometimes taking a short break from what you like is necessary when taste fatigue develops. Super Sentai has been there for 40 years and after some time I wanted to focus on nothing but Super Sentai (even I didn't want to check out more Kamen Rider whether it was Showa or Heisei) but the inevitable arrived. It's Super Sentai taste fatigue. Eating too much of one's favorite food can develop taste fatigue you know. It's already 2016 and yet I still can't forget why I really don't bother to rewatch most of Kamen Rider Decade except for the crossover with Shinkenger. Decade felt like an interesting concept. It's the tenth entry of the Heisei era of Kamen Rider hence its name. It was going to feature other Riders but instead we have Alternate Reality. The more I watched the show the more I just wanted to think about it, "Well Saban's Masked Rider made its return with a sequel. It's got better acting, special effects, action scenes and it's no cheap flick. On the other hand, the writing is almost as bad if not it's just as bad as Saban's Masked Rider!" That's why I love to call Decade as the pseudo-sequel of Saban's Masked Rider. It's no joke that Kamen Rider EX-AID gets me EX-cited (pun intended). I started the first four episodes and it's pretty standard with all the necessary introduction and, "Buy our toys." At the same time, there's this mysterious black version of EX-AID known as Gemn who's aligned with the Bugsters. 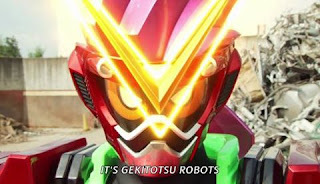 The show introduced newer concepts with Kamen Rider such as combining video game skills with saving patients while the show's theme is to save patients without using continues. Because in real life, there are NO continues.